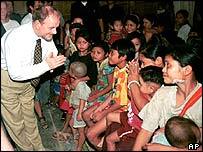 Former Foreign Secretary Robin Cook, 59, has died after collapsing while out hill walking in Scotland. The Labour MP for Livingston was considered one of the Commons' most intelligent MPs and one of its most skilled debaters. He spectacularly resigned from Tony Blair's Cabinet in March 2003 over the Iraq crisis. One of the highest profile figures in the Labour party, he delivered a withering speech on the decision to go to war with Iraq, as he quit government ranks. 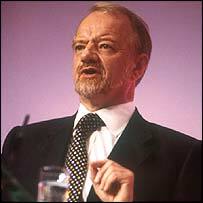 But many people regard Robin Cook's finest moment in the Commons as his devastating analysis of the Scott report on the arms-to-Iraq scandal. Just two hours after being handed a copy of the 2,000-page document, the then shadow foreign secretary pulled apart the Conservative government's handling of the affair with what was regarded as a bravura performance. Some of Mr Cook's enemies regarded him as arrogant and distant, while his supporters believed he should have led his party. His time in government will also be remembered for the personal problems which dogged him and for his unexpected demotion from the Foreign Office in 2001. Mr Cook was born Robert Finlayson Cook on 28 February 1946 at Bellshill, Lanarkshire. Nicknamed Robin at school, he attended Aberdeen Grammar School before studying English Literature at Edinburgh University. A councillor in Edinburgh between 1971 and 1974, the passionate horse-racing fan was MP for Edinburgh Central between 1974 and 1983. He held frontbench posts for Labour since 1986, when he was appointed as a spokesman on economic affairs, which was followed by a long spell as shadow health secretary. Mr Cook took over the trade and industry brief in 1992 before becoming Mr Blair's foreign affairs spokesman in 1994 - a role he continued as foreign secretary when Labour came to power in 1997. Mr Cook began his Parliamentary career on the left of the Labour party, but under Tony Blair dropped his commitment to unilateral nuclear disarmament and withdrawal from the European Union and praised Mr Blair's "Third Way". There were high expectations when he took on the role of foreign secretary, but he had a rough ride in the job. He effectively made himself a hostage to fortune by declaring that he would bring an "ethical dimension" to foreign policy - a vow which often came back to haunt him, particularly after he sanctioned the sale of 16 Hawk jet fighters to Indonesia. His split and eventual divorce from his wife - with Mr Cook revealing an affair with his secretary to his wife Margaret as they prepared to head off on holiday after a phone call from Downing Street - caused a welter of embarrassing headlines. His ex-wife wrote a book in which she said of her former husband: "His self-regard was easily punctured and his reaction was protracted and troublesome." Mr Cook responded by saying the book was "vindictive and undignified". Mr Cook was also seen as having committed a major diplomatic clanger during a trip to India and Pakistan with a suggestion that the UK could mediate in any negotiations over Kashmir. However, after eventually marrying his mistress, Gaynor Regan, in a secret ceremony, many of Mr Cook's troubles seemed behind him as Labour approached the 2001 general election. So it was a major surprise when he was demoted to become Leader of the Commons in Tony Blair's post-election reshuffle. Although his new job represented a step down, Mr Cook proved very comfortable in the role and espoused a commitment to modernisation. He initiated significant reforms of the House of Commons, with sweeping changes to hours and procedures. Attempts to reform the House of Lords, however, proved more difficult, while there was an embarrassing defeat on plans to take select committees out of the control of the whips. Six months after quitting his cabinet post in 2003, Mr Cook said he had become "increasingly angry" at himself for not trying harder to persuade the prime minister against going to war with Iraq. From the backbenches, Mr Cook continued to commentate on the Iraq war. Last August, he said Mr Blair should "learn the lessons" of Iraq and make a pledge to the party conference that he would not launch anymore "pre-emptive strikes". Shortly before the 2005 election, the former cabinet minister praised Gordon Brown's record. Writing in the Evening Standard, he said Mr Brown would take over from the prime minister "sooner rather than later". It was thought in some quarters that Mr Cook could have made a return to the Cabinet in any future Brown government. A natural political loner, he had built up a base of support on the backbenches that he had, perhaps, never enjoyed as a cabinet minister. His stance on the Iraq war - and his resignation speech - only enhanced his reputation as a man of principle and a great Parliamentarian.